Built for the working musician, the Behringer Europower EPQ304 is exceptionally light, packs massive power and they are built to last through all the rigors of the road. The Behringer Europower EPQ304 300-watt 4 channel power amp offers the power of Accelerated Transient Response (ATR) technology into an exceptionally lightweight package. Ample power and high-tech efficiency combine to give you a feather-light supercharged workhorse that will keep your rig kicking for years to come. The Behringer Europower EPQ304 300 Watt Power Amp was built for the working musician. They are exceptionally light, they pack massive power and they are built to last through all the rigors of the road. Plus its light price tag will leave you with enough cash left over to acquire more stuff to amplify! The simple front panel controls of these amps give you all of your sound's vital signs at a glance. After pressing the Power Button, the power LED will light when the amp is ready for action. Both channels have independent gain dials as well as clip LEDs that indicate when the signal is distorted and you need to reduce the gain. There are also signal LEDs that light up when a signal is present at the input. The back panels of the EPQ304 accept balanced XLR. The EPQ304 has an MONO On/Off switch for INPUTS 1 AND 2, and another MONO On/Off switch for INPUTs 3 and 4. It takes huge pulses of energy (current and voltage) to propel a woofer cone out fast enough to match a bass beat. That's called Transient Response and it's the holy grail of amp designers. By carefully selecting transistors with extremely high slew rates and optimizing other proprietary parts of our circuitry, Behringer amps are able to react instantly to even the most demanding electronic bass impulses. If the woofers in your PA system can keep up, your audience will hear a tighter, crisper, more natural sound. Fantastic amp with some punch. I have a subwoofer connected and it sounds amazing. Yes. I have a couple of Behringer amps. Very dependable. Love the simple ease of use. Like their other amps (I own 2 450s), this thing is built like a u-know-what house. Solid. It's actually lightweight for what it is, I was surprised at that. But hey, who wants to lug a rack that weighs more than you? Well-made; knobs, switches comfortable and sturdy. Light display is professional(by that I mean not gaudy)and to the point. I like the flexible nature of this device. I use it for monitors (with the 450s running primary and secondary mains). I run 2 Kustom KPM 110s and 2 210s wedges. This handles them perfectly without having to max out the amp: plenty of power. Manual was not very descriptive, but that was only disappointment I had (and a little one at that). Well, the manual doesn't amplify and distribute the signal, so I can live with it. Four channels instead of two is great, especially with the options available (mono/stereo/bridge). The only thing i would change is most folks have cords with 1/4" TS (or TRS) jacks, not the Speakons. I solved that by getting neutrik adapters, but they are like $9 apiece, so some might be hesitant to do this. For me, I like being able to handle any cable I need to use (and most of the 50's I have are 1/4"TS), so it was the option I chose. As I stated, this fits for me, so I can't say how it might work for someone else using it for a different application. Beautiful. I run it off a power conditioner (a Furman M-8Dx I also got thru AMS) and there is NO hiss, NO hum. It is quieter than the 450s, which aren't that loud to begin with. Great value for a small studio amp at $229, not sure if i would have paid the original retail of $449. Only been using it for 2 months but so far so good. Protection circuitry is very sensative (which is a good thing). Good mounting brackets prevent any twisting of chassis. Four seperate channles in one amp make for a great versitile system. I route my mixxer outs into 2 ch and playback from multi trac recording into the other two wich greatly reduce the amount of space i needed before. This amp sounds great as long as some type of pre-amp is line such as mixxer or active preamp eq system. Basic operation very simple. More info on the wiring of locking output plugs would be helpfull in the manual, I would also recomend AMS to recomnend the plugs or premade cords upon purchase. The manual is also vaig on the speaker impedance options, such as can impedance vary on all four chans, accepts 4 or 8 ohms (but will 6 damage amp?) 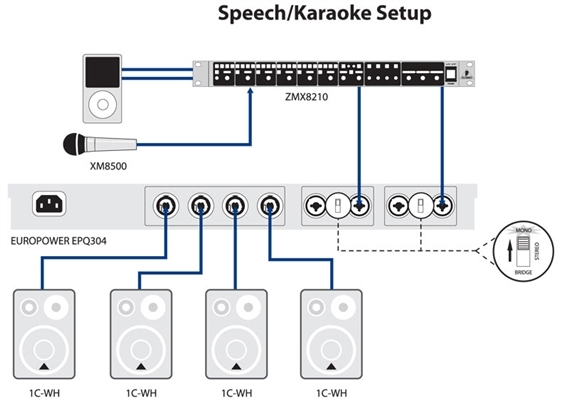 This info would be helpfull if it was being used to drive multiple speaker configs with passive filters. Tone is great once it is enhanced by mixer or EQ. Has great clear response in all bands. Bass has a snappy clear response with no warble. Very Happy with this unit. I would spend up to $600 if this unit included pre-amp and 3 band parametric eq per channel. That would take its versatility to whole new level!